Hello fellow bloggers! I have managed to make it into my craft room a little over the last week and I have decided that although I want to continue blogging and sharing, I am going to take a break from the time consuming process of explaining the card or listing all the supplies. I would like to speed up the process a bit to help focus on my goal of utilizing time in a more productive way. Needless to say I do appreciate the sharing aspect and if there is anything you would like to know, please ask and I will certainly share details. On that note, I would like to share a Wedding shaker card that I created for a fellow colleague who got married in Australia over the Christmas Break! She is just such a fun young girl and when I saw this card on Pinterest, I knew it was perfect for her and I certainly scraplifted the whole idea and changed very little. Thanks so much for the inspiration Nichol Magouirk! What you don't see in my card - as I was negligent on taking a photo - is that I turned it into a trifold card with a gift certificate holder. This allowed for all of our staff to sign the card and send our best wishes! 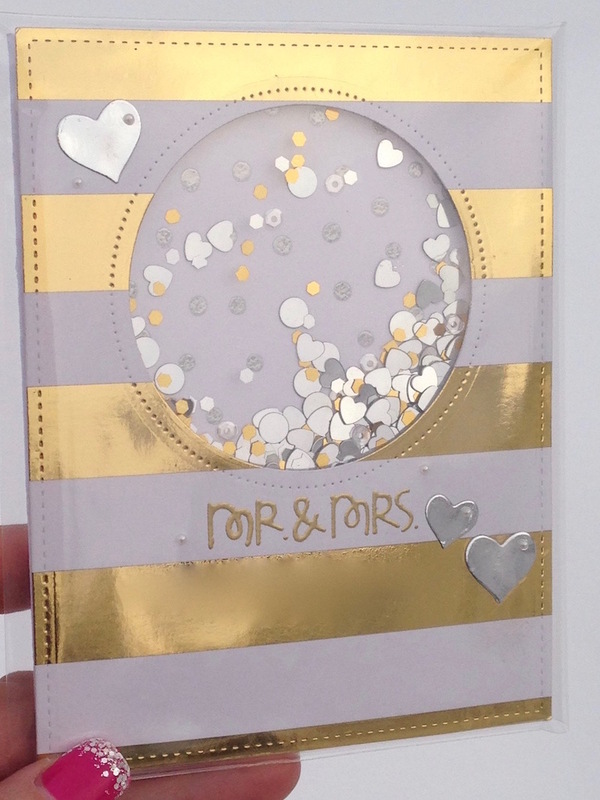 This card allowed me to try out my minc machine and I have to admit . . . I LOVE IT!!! Like others, there may be a lot of foiling in my future! I have noticed, however, it is super difficult to photograph shiny projects without getting a dark reflection of yourself or your camera. I found holding it up on an angle away from me helped with that process. OH WOW ... VERY pretty and what a great idea to make a shaker card! Awesome! Thanks so much for joining us at The Sisterhood’s ‘Something OLD, Something NEW’ challenge and please come back again soon! Thanks for playing along with our "Something Old, Something New" challenge. Ooh la la...this is one stunning wedding shaker that is certain to bring a mega-watt smile to the newlywed's faces! Gorgeous! Thank you for sharing your *Anything Goes* design in the ATSM gallery! I'm back...I rarely come across card-makers who live in the same province as I do, so a special HELLO! Hope to see you in the ATSM gallery often (and perhaps Inkspirational and Tag, You're It as well! Yayyyy for Albertans!